Our method performs a global search in each frame, making it resistant to fast, unpredictable motion. 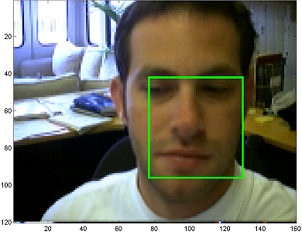 Second, we run a slower but more accurate feature-based face detector in parallel with the color-based system, and use its results to dynamically adapt the color models of object and background, reducing sensitivity to lighting conditions. The color system uses a generative model, allowing us to model the colors in the object and the colors in the background independently, and to adapt the parameters of the model over time. Download Bayesian Filtering .pdf file here. 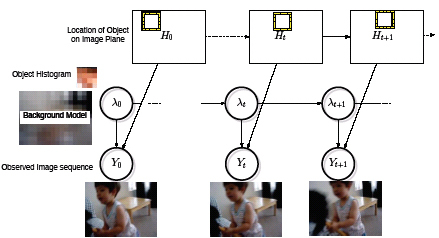 Bayesian filtering provides a principled approach for a variety of problems in machine perception and robotics. Current filtering methods work with analog hypothesis spaces and find approximate solutions to the resulting non-linear filtering problem using Monte-Carlo approximations (i.e., particle filters) or linear approximations (e.g., extended Kalman filter). Instead, we digitize the hypothesis space into a large number, n _ 100, 000, of discrete hypotheses. Thus, the approach becomes equivalent to standard hidden Markov models (HMM) except for the fact that we use a very large number of states. One reason this approach has not been tried in the past is that the standard forward filtering equations for discrete HMMs require order n2 operations per time step and thus rapidly become prohibitive. In our model, however, the states are arranged in two-dimensional topologies, with location independent dynamics. With this arrangement, predictive distributions can be computed via convolutions. In addition, the computation of log-likelihood ratios can also be performed via convolutions. The hidden variable H determines which pixels belong to the object and which belong to the background. The object pixels are rendered independently from an object histogram. The background pixels are rendered independently from a space variant background histogram model. An example of uncertainty propagation.The left side shows the most probable hypotheses at time t, i.e., the filtering distribution. The image on the left shows the predictive distribution for time t+1, i.e, the prior distribution for the next time step. In order to determine the conditions in which our new system works effectively and the conditions in which it falters, we are carrying out experimental simulations on datasets of video footage containing, among other confounding factors, variable lighting conditions and complex backgrounds. The source code, written in multi-platform C++, is freely available to the research community, and is in use as a control and feedback mechanism for communication robots and for the Colorado University platform for computer agent animation.